Three-month-old Chandni Chowk is already popular among students from SRM University, which is five minutes away. 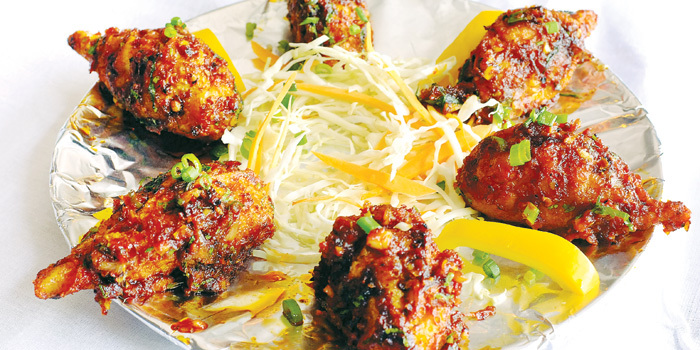 Situated on 100 Feet Road, the menu here offers North Indian and a sampling of Chinese for variety. According to Sudhir Kumar Sinha, there are several dhabas in the city but Chandni Chowk offers something different. a�?Each dish here goes through some innovation a�� be it momos or a plain butter chicken,a�? begins Sinha, a former interior designer, adding, a�?I wanted to bring the North to Chennai.a�? Sinha promises that their veg momo toss is unique, and he may be right. The momos are first baked, then fried and finally coated with masala. Next up is the spicy crisp corn, with a hint of sweetness that is addictive. For non vegetarians, there are seafood starters like fish tikka, fish fingers and Amritsari macchi. We choose the juicy chicken lollipops instead. For mains ita��s a lachha paratha and butter naan with a traditional paneer butter masala. The layered lachha paratha is reminiscent of the parathas served in the Gali Paranthe Wali in Chandni Chowk. And their murg kofta or kadai chicken would be our recommendation if you seek a thick and creamy gravy. Dona��t leave without trying their sweet lassi with rose essence and also a cube of malai. a�?The best lassi that you get in Delhi is at Connaught Place,a�? shares Sinha as we focus on our phirnis. The smooth rice pudding reminds us of Kolkata, where we have tasted the best. Sinha also shares plans to open a separate restaurant only for vegetarians, but we hope he opens a counter for chaats, to which he nods in agreement.